Forget the Google vs. Yahoo comparisons. Those are old news. Investors looking for a more interesting and current stock story should turn their attention to the Google vs. Baidu match-up. Baidu (BIDU), China's largest search engine, received a bullish $1,000 price target Thursday from Susquehanna International Group analyst Ming Zhao, after reporting stellar first-quarter earnings that included net income growth of 165% for the period. Part of that growth came at the expense of Google (GOOG) after the Internet search giant withdrew its search business from mainland China rather than continue to submit to that country's censorship policies. Google, despite its lofty run up in share price and equally strong quarterly results, has never garnered a $1,000 price target from any of the official Wall Street firms, which tend to hold their analysts' feet to the fire if their forecasts are wrong more often than right. The search giant, however, did manage to land a $1,000 price target with Wall Street prognosticator Paul Kedrosky in 2007. In raising Baidu's price target to $1,000 from his previous $728 a share level, Zhao said in a research note: "We are raising our price target on BIDU shares to $1,000 following strong 1Q results and 2Q guidance. Margin expansion due to accelerating monetization, and later followed by faster customer acquisition, moves our non-GAAP EPS estimate to $21.74 for CY11." Baidu's share price jumped a whopping 14.2% by the Thursday's close, ending at $709.87 a share. From the beginning, there were signs that Baidu would be a formidable competitor for investors' attention. Baidu, which set its IPO price at $27 a share in August 2005, soared a whopping 354% on its first trading day. Google, by comparison, used a Dutch auction to set its IPO price at $85 a share in 2004, and gained 18% by the close of its first day of trading. In their public debuts, Baidu ended the day at $122.54 a share, Google at $100.34 a share. While initial IPO investors made out extraordinarily well on Baidu's first day of trading, what that means is that Baidu and its bankers left a lot of money on the table. The Chinese company could have pocketed significantly more money for operating capital if its IPO price had been set at a level that more accurately reflected its perceived market value. The gap has further widened since their IPOs. To date, Baidu IPO investors who held onto the stock have seen their returns increase about 2500%. Meanwhile, Google IPO investors are holding gains of a mere 525% or so increase, with the search giant closing at $532 a share. Still, no comparison of the two search firms' stocks would be complete if it ignored their market capitalizations. Baidu's is a respectable $24 billion or so, but Google's total valuation is still more than five times larger at almost $130 billion. But the share-price gap is expected to further widen, according to analysts. "Baidu is outgrowing the market, as the total pie of search is adversely impacted by Google's situation," Zhao noted in his report. Over time, analysts expect an increasing number of advertisers, the revenue drivers for both search companies, will switch to Baidu from Google, which is working to serve mainland China customers through its site in Hong Kong. 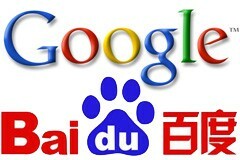 "Google.cn moving to Hong Kong means Baidu will be dominant in China's search market share," Zhao said. "We believe the share change is attributable to Baidu's continuous growth versus Google trending somewhat lower."